Today's post is a biggie. We're sharing a project that we've been nurturing since the beginning of the year. And it has finally launched. Yay! Zoosch is a jewellery business run by husband and wife team Riaz and Sameera Paruk. They sell the most stunning stainless steel jewellery and offer agent positions to sell their products. We did quite a bit of work for them and enjoyed every moment. It started off with tidying up their branding. The heart in their logo was a photograph which isn't the best for large-format high quality printing, so we changed it to a simple geometric heart-cut jewel shape that can also be used independently as a brand mark. And we developed a 5-colour palette to use across their branding. Once the logo and palette were finalised we created their business cards, designed a cute little A6 invoice book for their agents and also some product tags for print to attach to their little jewellery bags. The biggie was the catalogue we put together. It has 17 double-sided pages filled with beautiful photos of Zoosch jewellery taken by CC Rossler. We did the layout, of course. The catalogue covers were custom made (20 of them) by us from recycled plywood that we cut to size, whitewashed and bound with mock-leather. The Zoosch branding was applied to the cover which also has protective chromed steel corners. The pages are held together with interscrews and the catalogue can be opened up so that new pages can be changed and added seasonally. Each finished catalogue was wrapped in tissue paper with a sprinkle of custom-made Zoosch-coloured confetti, and closed with a sparkly piece of silver washi tape. They are invididually presented to agents on sign-up, along with the invoice book, in a branded hessian bag. Electronic versions of the catalogue sections were also created for downloading from the responsive Zoosch website which was expertly developed by Jean from Netlive. You have to go and check it out. It's beautiful. 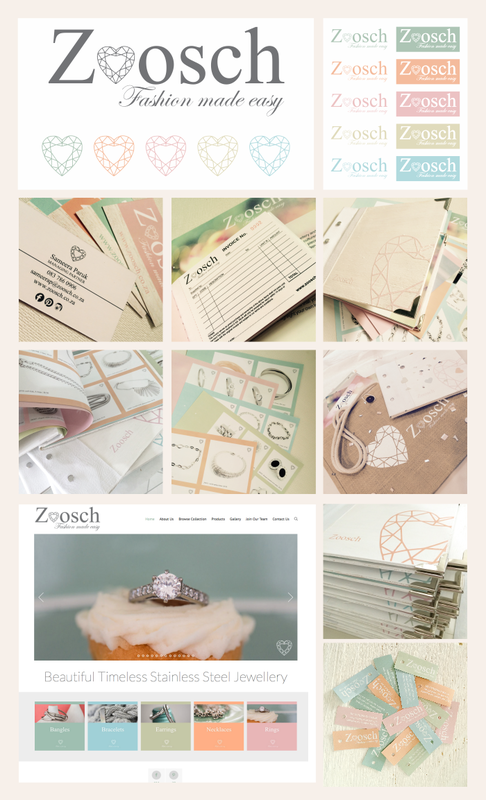 Next was the Zoosch Facebook page, which we're in the process of helping them manage by creating cover images showcasing their beautiful pieces, designing little adverts and marketing images of their products, and scheduling posts. Please go and like it, you'll be blown away! Here are some of the production pics. There are too many to share them all.